A pineapple cake has a subtle form of taste that gradually grows on your taste buds. Nothing tastes better than a white pristine cake with shreds of small pieces of pineapple thoughtfully put on the surface. Embellished with yummy creamy layers with dressings of beautiful edible flowers and cute looking small cherries, this cake is for sure an absolute delight. Treat your taste buds to this heavenly cakes and we‘re sure you are simply going to love itsdivine taste. Go, grab your order now for a lovely and a delightful pineapple cake. 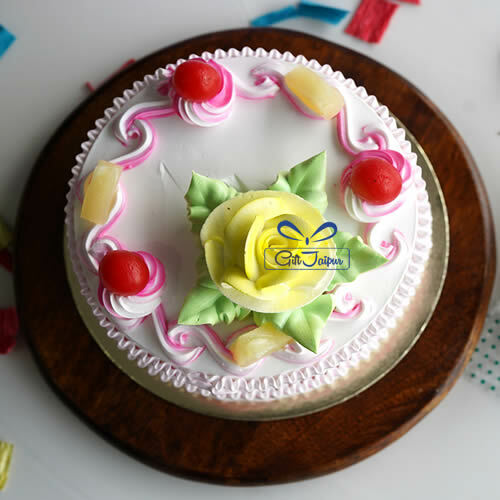 Get this extremely beautifully designed and delectable pineapple cake on Valentine’s Day and make your celebrations even more special. 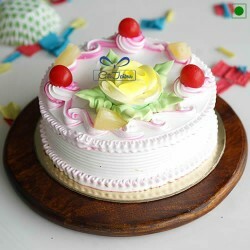 Order this cake for your family who will surely love its enticing taste.